A great alternative to a set of dumbbells and bench! 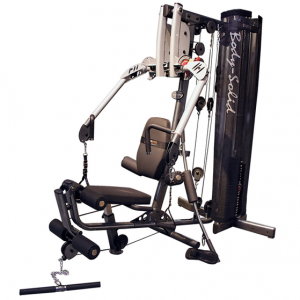 The BodyCraft XPress Cable Arms utilize pulleys and cables for unrestricted, completely natural, and biomechanically correct movements. You define the path, providing for a greater, more natural range of motion, which incorporates the use of stabilizer and core muscle groups (an advantage not found on typical home gyms). 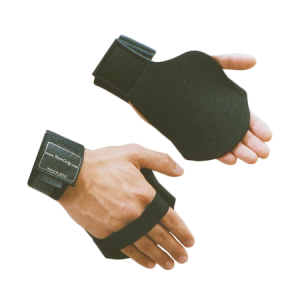 The mini-XPress is an effective way to build strength and balance for every day activities, or for recreational sports! Rotate the Cable Arms to the lowest position for exercises such as Arm Curls, Lateral Raises, Front Raises and Shrugs. Rotate them upward for exercises such as Pec Flies, Bench Press, Incline Press, and Decline Press. 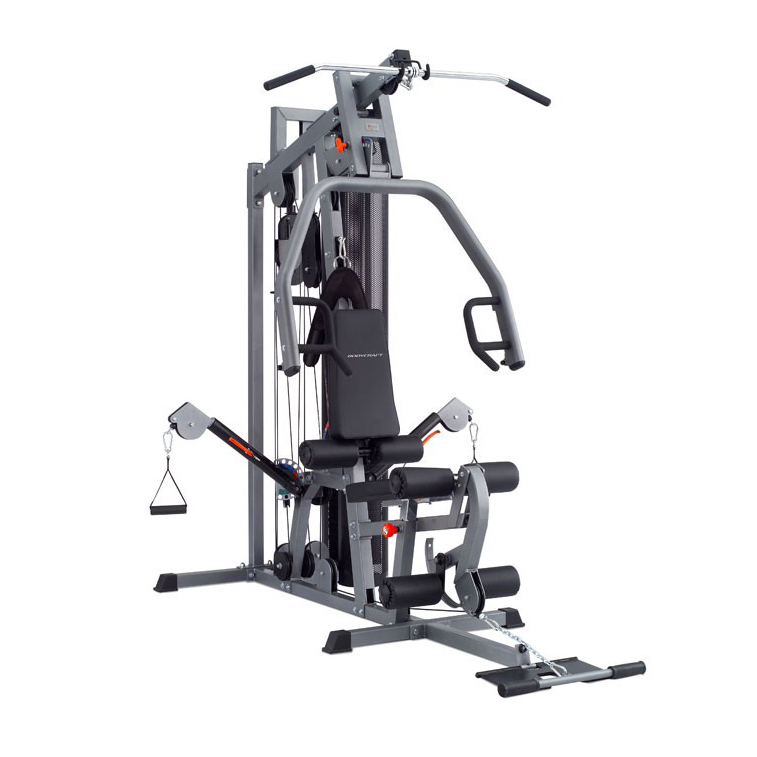 Adjust the Cable Arms to the top position for the Shoulder Press exercise. 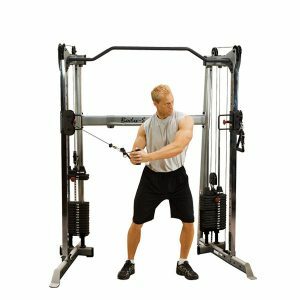 These versatile Cable Arms also provide for sports specific training; movements mimicking your golf swing, tennis, hockey, baseball, etc. can be performed. 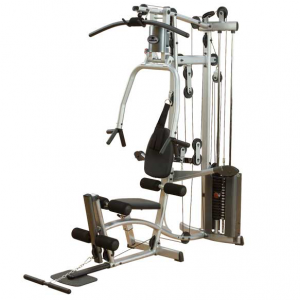 In addition, a wide range of specific rehabilitation exercises are possible, making this a truly versatile home gym! 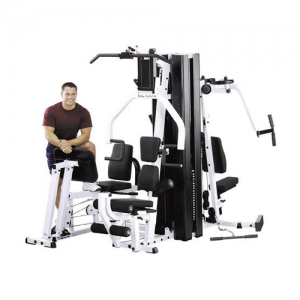 • Bench press station with adjustable starting point. This allows for different size users and also provides a variety of exercises including Bench Press, Incline Press, Shoulder Press and Mid Row . Seat and seat back are adjustable. 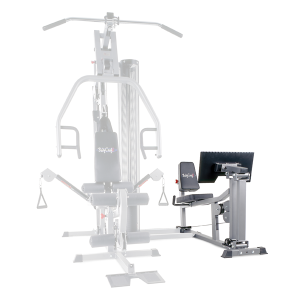 Back pad tilts to ensure full support when performing incline and shoulder presses. 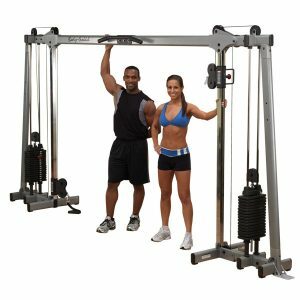 • Cable station with adjustable arms, allows for a very wide array of exercises including Sports Specific, Core Training, and exercises that mimic Dumbbell Training. • Ab crunch station for abdominal training. • Low pulley station with foot plate for Low Rows. Fold the footplate down for Abductor and Adductor Leg Kicks, Arm Curls, upright rows, etc. • High pulley station for Lat pull Downs, and Triceps Push Downs. 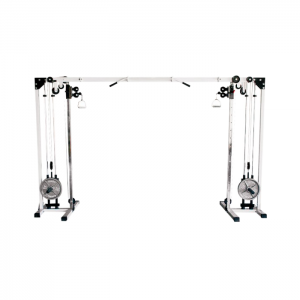 • Self-aligning leg extension and curl station provides Seated Leg Extension and Standing Leg Curl. Automatically adjusts to fit all leg sizes. • Sealed, internally lubricated bearings at all pivot points. • Optional leg press attachment for full leg development. • Space saving design allows placement against a wall. 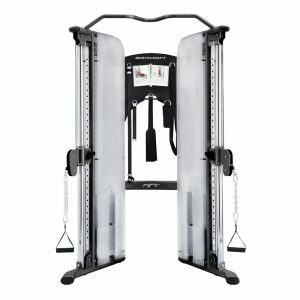 • Unique doubling cable increases the resistance to a 2:1 ratio, providing for up to a 400 pound bench press. • Frame: Heavy 2″ X 2″ and 2″ X 3″, 11 and 12 gauge steel tubing. • Finish: Silver Vein finish is electro-magnetically applied in powder form to evenly coat all surfaces, then baked on at high temperatures for a tough, long lasting finish. 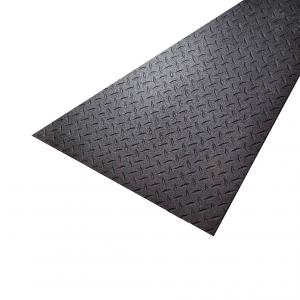 • Upholstery: Double stitched vinyl covering 2″ thick, high density foam, contoured for comfortable Lumbar support. • Pulleys: 4-1/2″ diameter, fiberglass impregnated nylon pulleys with sealed ball bearings. • Cable: The most flexible nylon coated, 7 X 19 strand aircraft cable rated at over 2000 lbs. tensile strength. • Weight Stack: 200 lbs. in 10 lb. increments. Precision milled cast iron plates with nylon bushings for smooth action. • Weight Stack Enclosures: Noise dampening, perforated steel weight stack guards provide safety and beauty. • Guide Rods: Chrome plated 1″ diameter tubular steel. • Bearings: All pivot points rotate on internally lubricated bearings. 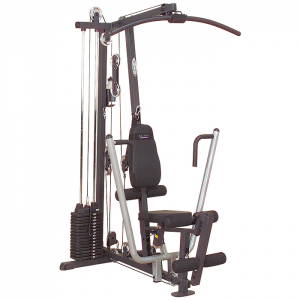 • Accessories: Lat Pull Bar, Curl Bar, Ankle Strap and two Single Handles are included. • Dimensions: 82.9″ deep x 56.5 ” wide x 83″ tall (85.45″ wide x 90.5 deep with optional leg press). 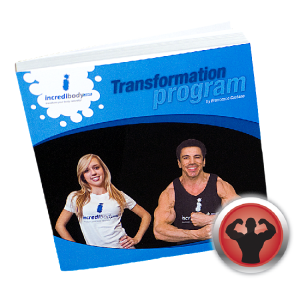 • Some of the more than 50 exercises include leg extension, leg curl, inner thigh, outer thigh, calf raise (with optional leg press), leg press (with optional leg press), barbell style curl, dumbbell style curl, triceps push down, triceps extension, forearm curls, cable crossover, mid row, low row, one arm row, lat pull down, ab crunch, barbell style shoulder press, dumbbell style shoulder press, lateral raises, front raises, shrugs, upright row, barbell style bench press, dumbbell style bench press, barbell style incline press, dumbbell style incline press, dumbbell style decline press, and cable fly. • Lifetime Warranty: Since it is built to last a lifetime, every part of the BodyCraft XPress is guaranteed for as long as you own it. We will replace or repair any defect. Warranty applies only to the original owner and for in-home use.